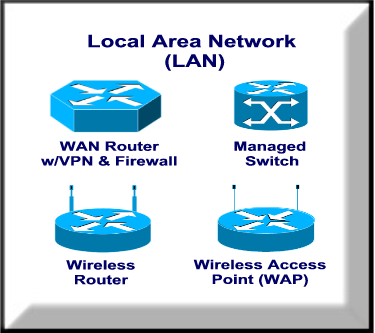 Description The Local Area Network (LAN) component includes all hardware, software, and network systems required to support the network connectivity requirement of the small business. H/W Components LAN hardware include multi-WAN routers, Ethernet switches, Wireless Access Points (WAPs), and wireless routers. TIMC Monitoring The Multi-WAN VPN Router also supports both SysLog and SNMP. This router continuously sends performance, problem, and security log information to the SysLog and SNMP applications running on the TIMC. TIMC Remote (or Local) Management All LAN hardware components include includes an network administrator interface that enables these components to managed via a standard web connections. Each component is assigned a unique local IP address and this enables these devices to be managed by the TIMC server. Performance Reports LAN availability reports are created weekly, quarterly, annually, and on-demand. Problem Reports Copies of all LAN-related trouble-tickets are sent to customers daily. Closed trouble-tickets are sent to customer as soon as problem is resolved. Archived Statistics and Problem Reports All LAN-related performance statistics and problem reports are archived on SQL database and are available online at any time. "The LAN is the Central Nervous System for Your Business!" LAN devices such as those listed above, contain remote management interfaces that enable them to be managed by our TIMC management platform. If you need more information regarding the LAN components described above, call us at (602) 478-4778 or (623) 979-1827.